A film crew from Shanghai is here to film a docu­mentary to promote Fiji’s tourism opportunities to China. Since arriving in the country, the film crew visited a number of local resorts and islands and also took part in a few adventure activities. Pleass Global managing director Warwick Pleass hosted the crew from Shanghai at Kila Eco Adven­ture Park. “Pleass Global is pleased to wel­come our Chinese guests and also to have Investment Fiji Export manager Ronesh Chand present to discuss opportunities in the Fiji Islands,” he said. Pleass Global’s premium natural artesian water VaiWai was also on show as this product is export­ed to China. The crew filmed extensively in Kila Eco Adventure Park and also filmed VaiWai production pro­cesses. Investment Fiji Export manager Ronesh Chand said: “The Fijian Government has announced a number of incentives and pro-growth policies to attract invest­ments and encourage economic growth that is stable and sustain­able and aimed at increasing in­vestor confidence, encouraging innovation, growth and invest­ment. “The Fijian economy is antici­pated to grow by 3.8 per cent in 2017. Mr Chand placed greater empha­sis on the tourism industry play­ing a vital role in growing and sustaining the Fijian economy. He said that in 2016, the tour­ism industry contributed 28.8 per cent towards Fiji’s gross domestic product. Visitor arrival numbers reached a peak of 793,000 and spending amounted to $1.6 billion with employment of approximately 119,000 Fijians. In 2016, Fiji highest growth mar­kets were China, South Korea, India and New Zealand. 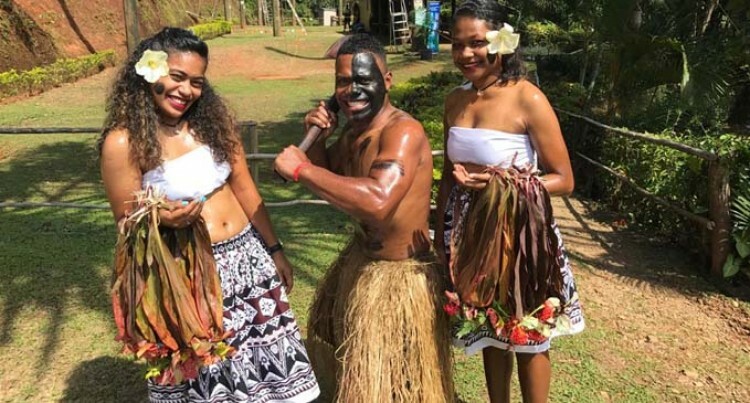 Australia remains Fiji’s largest market for tourism. “Fiji is ready to offer more and better ranges of services to tour­ist with recent development of $250m Marriot Momi Bay Resort just opening its doors this year. “Some new upcoming projects for tourism industry is $300 mil­lion Six Senses Fiji Vunabaka ho­tels on Malolo Island, $70 million Pullman Nadi Bay Resort and Spa in Wailoaloa, Nadi and $500 mil­lion New Era Gloden Sand Hotel in Lomolomo, Lautoka,” said Mr Chand. He also mentioned that Fiji is a popular investment destination for mineral and groundwater re­sources. Mineral water is Fiji’s one of top 10 export commodity and in 2016 the export earnings was $212 mil­lion. “VaiWai is one of the Fijian pure artesian mineral water’s which has made its presence in global markets such as China,” he said.